I had a wonderful surprise this morning when I opened my email. 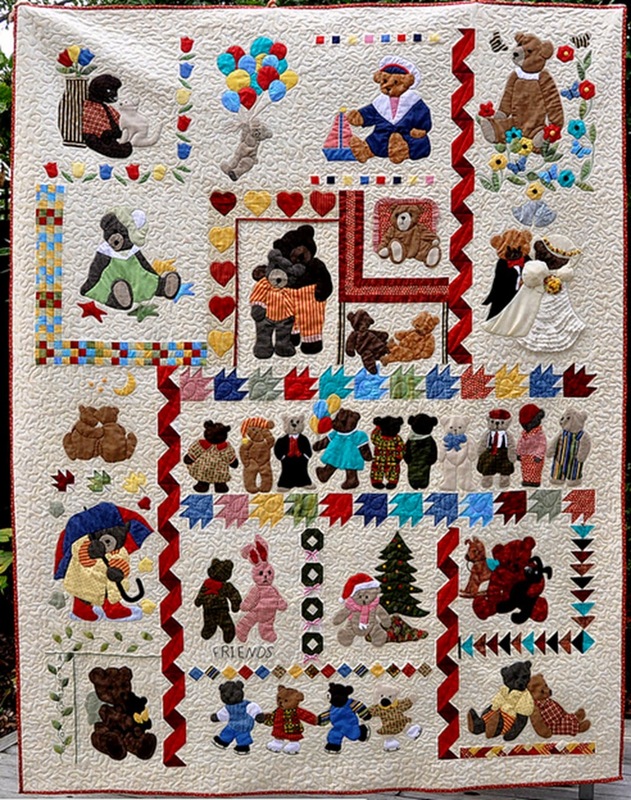 Carolyn V. W. of New Zealand (no Blog) emailed me to let me know that she had finally completed her "All About Bears" quilt, the patterns for which, she had purchased in 2009. At the time, Carolyn had never attempted hand applique, and this quilt was to be her first attempt. Well, what do you think? Isn't it fabulous! If you want to see more photos of her quilt, here is the link to her photo album https://www.flickr.com/photos/67119440@N03/sets/72157632465572363/. On the home front, my new little grandson is doing well, and has gained a little more weight, and has finally reached the 6 lb. mark. If the weather will co-operate I hope to have some photos of my recent quilts in my next post. She's done a great job - but then she had a wonderful pattern to work with. Good news about your grandson. Carolyn has done a great job of your design, can't believe it was her first attempt at hand applique, how amazing. Glad to hear your grandson is doing so well!